Maternity care as we know it is based on myths that are hammered home as truths. 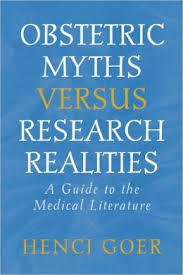 This book offers the chance to break free form that pessimistic model and embrace on of genuine health care. Ms. Goer teaches you how to understand the medical/obstetric literature... She also shows through the literature how midwifery and out-of-hospital birth are scientifically valid and more likely to result in a healthy mother and baby.